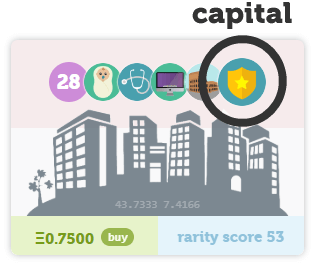 The goal in CryptoCities is to grow the value of your assets, trade them for a profit, and build the biggest empire. This is no easy feat, with many active players fiercely competing to be top dog! In order to be the best you will need to be play strategically, be active, and keep an eye out for opportunities. We are constantly evolving and growing the game with new features to help you build your empire. Many of the game's key features are already live, such as city & country ownership, the marketplace, territory, and gold. We have a solid development schedule with new updates rolling out just about every month. Just about everything you do in CryptoCities centres around locations - from capturing territory to earning gold. You will usually need to own at least one location to get started. Start by heading over to the marketplace and buying your first location. 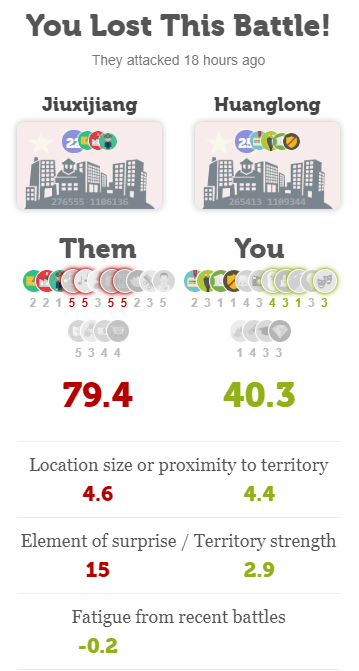 Bigger more sought after cities are obviously a lot more valuable and will offer advantages over smaller locations, but for your first location pick any size to get started. Even the cheapest location will allow you to start fighting battles and earning gold. Every location has a starting size from 1 to 50 points. This size is a rough measure of the size of the place in the real world. For instance, a big city like London or Beijing will start with 50 points, whereas a small village may start with 10 points. 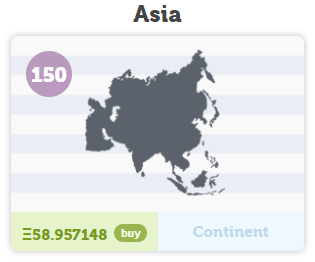 These points can be enhanced over time by embedding other smaller locations. Most locations (generally size 3 and up) will have certain features. They give each location certain capabilities. Locations can have up to five features, depending on how big they are. If a location is available for sale then it's price will be displayed in ETH. 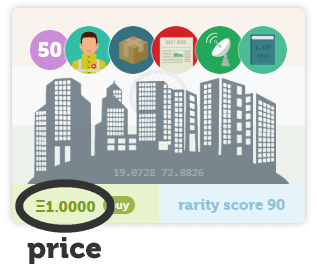 This price can be set to any value by its owner at any time. 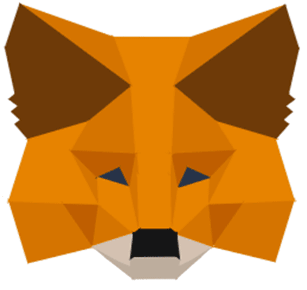 If you want to buy a location then click to buy it and you will be prompted to submit the payment in MetaMask. Assuming the correct gas is sent, you should receive the location within a few minutes. Every location belongs in a country. 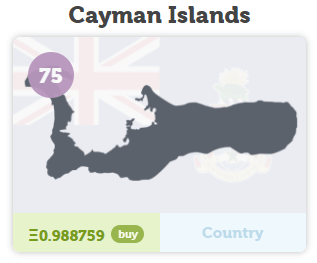 A dividend is paid to the country owner every time the location is traded in the marketplace. Around half of all countries have had locations issued so far, so there are still many opportunities for new players just starting out. 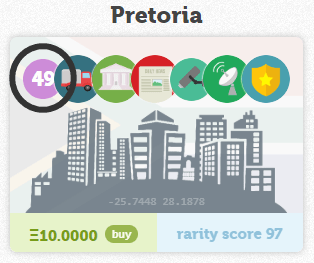 Rarity score is a rough measure of how rare a location is. The main components of rarity are the location's size and features. Rarity is subjective, so please only use this as a guideline. Every location has been verified using country official census data and google maps. When you own a location, you are the only person that can own it. The coordinates for every location are recorded in the blockchain. Controlling territory is the fastest way to earn gold. Every square earns 0.000864 gold per day, which is a lot faster than location points generate gold. If you want to start creating a steady stream of gold then you should capture as much territory as you can. This is hard to do in very active regions, so be sure to browse the marketplace for quiet locations which can be used as gold mines. 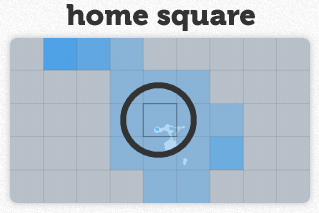 Your home square is the center square with a slightly darker border. It is the square that contains your location. It could also contain other locations. You can always attack and claim territory around your home square. You can only perform actions on territory that is yours or is adjacent to one of your blue squares or home square. Adjacent means above, below, or to the side, and does not include diagonal. 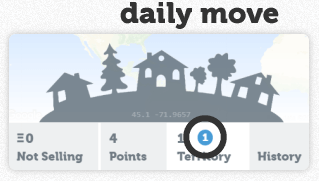 Every day you get one daily move per location. 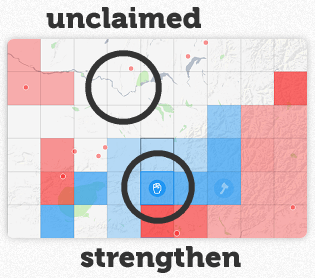 You can use this daily move to claim an empty square or to strengthen one of your existing territories. If a territory has not been claimed yet then it will not have a color. You can claim it by hovering over it and clicking the blue plus icon. Claiming a square will use your one daily move. When you capture a territory it will reset to full strength (this is used in battles). Gradually over time the strength diminishes to zero, making it weak and vulnerable to attack. The more faded the color of a square, the weaker it is. You can use your one daily move to strengthen a territory back to full strength. In order to do this hover over a blue square and click when the blue fist icon is displayed. 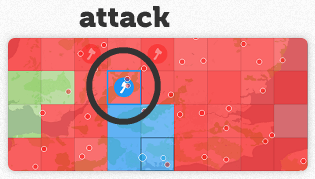 You can attack a red square that is next to one of yours by hovering over it and clicking the blue axe icon. Your battle options are then displayed in the right sidebar. There is no limit to the number of attacks that you can make each day. 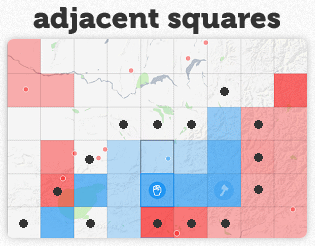 When a square is captured it can be attacked back after 24 hour. 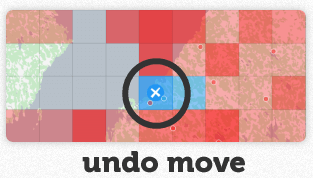 If you use a move to strengthen or claim empty territory then you have a minute to undo that move if you change your mind. If an action icon is pulsing then hover over it an click to cancel it. 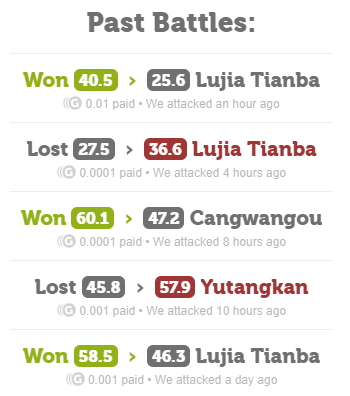 Battles are how you capture territory from other players. They require some strategic thinking if you want to win the majority of them. You can win more battles if you are careful to pick those with the best odds. Battles are run through a randomized process of drawing scored rounds. Based on each drawn round the attacker and defender will earn a score. The one with the highest score wins the battle. Although part of the process is random, many of the battle inputs are visible before the start, giving the attacker strategic insight into their odds. A big factor affecting the outcome of a battle is the strength of the territory. The defender gets +20 score for territory that is at full strength, but +0 for completely weak territory. 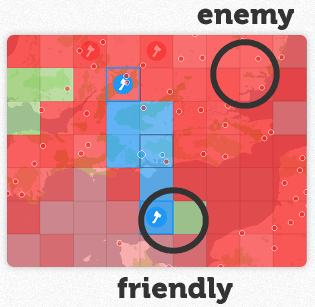 You should therefor focus your attacks on weak territory to improve your chances of winning. To improve your defence you should regularly strengthen your weak territory. The attacker will get +0 to +15 score depending on the type of attack they choose. 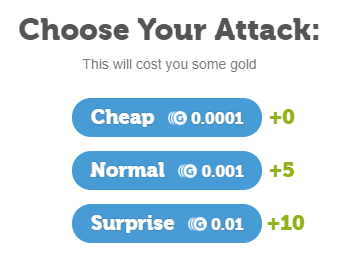 As an example, choosing a surprise attack will give you +10 score to start off with, but will also cost you the most gold. Every time you do a battle you become fatigued. This fatigue subtracts 7.5 from your next battle, but this penalty gradually decreases over the next 150 mins. It does accumulate though, so doing two battles back-to-back will penalize you -15 score on your next battle and will take 300 mins to decrease. This fatigue penalty will also be added when you are defending against attacks, so be careful not to leave yourself too exposed. Both the attacker and defender will get a score for how close they are to the territory square being attacked. If it's their home square the score will be +5, but if it's further away it will diminish. The rate it diminishes depends on the size of the location. The way to think of this is that bigger cities can 'project power' to territory further away from their home square than smaller locations can. 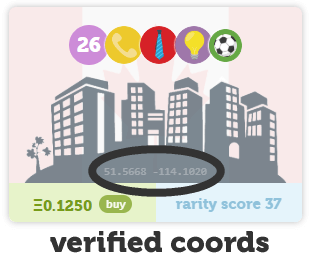 The random part of the score is generated using random feature rounds. Rounds are randomly selected in turn for both the attacker and defender. Depending on the feature that is selected the round will score +3 to +15. The locations features are used for this purpose, but are 'topped up' randomly with other features. If the attacker or defender owns the country that the battle is being fought in then they will receive a +2 bonus in the battle. 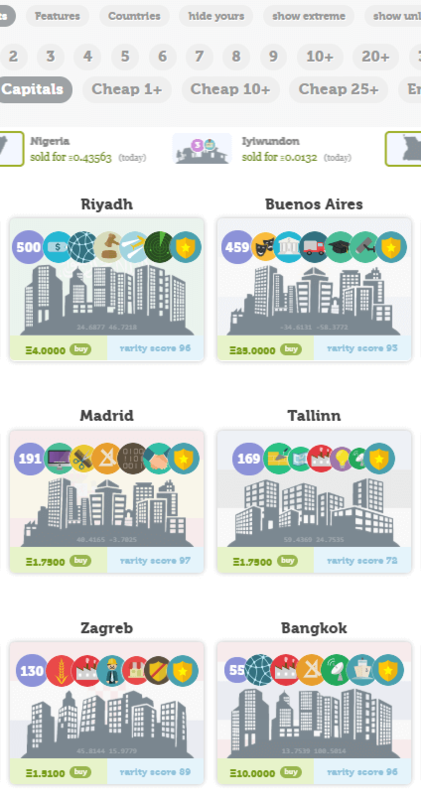 Big cities with many level 5 features will experience slightly higher odds of winning (between 0% and 5% depending on the starting score). If the above sounds complicated, just know that the higher your starting score going into a battle the better your odds. If you pick your battles carefully you can feasibly win 80% of your battles over the long-run. It's important to note that gold is not a token and it can't be exchanged for ETH currently. Although this is something we are investigating for the future, it is currently an in-game resource. We want to make sure that we have an active and thriving economy running before we add these types of mechanisms (to ensure sustainability). Most 3+ point locations have features (and some 2 point locations too). These are fictional characteristics and do not bear any resemblance to their real world counterparts. All features have a level. Level 1 is the lowest level and level 5 is the most advanced. Small locations can generally only have a few low level features, while big cities can have many high level features. Higher level features are more rare. Some features are very common and can be found in just about any size location. For example, Food and Water can be found anywhere. 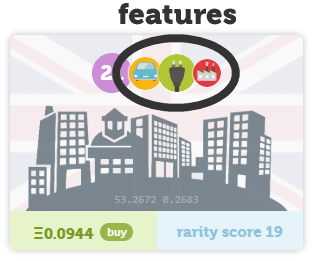 Other features are much more rare and can only be found in bigger towns and cities. For example, Diplomacy and Research can only be found in 27 point locations or higher. Some special features do exist for other purposes. For example, there are some Gem features that are used during discovery phases of the game. There is also an Early Bird feature which is a pending reward for some early players. Features are currently used in battles to provide some random scored rounds. A big city with many level 5 features will experience slightly better odds in battle depending on the circumstances (0% to 5%). But this is generally outweighed by other factors. 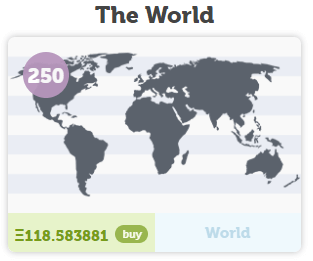 In addition to owning locations, you can also own countries, continents and the world. These are known as premium assets and they trade slightly differently to normal locations. Although many have been purchased for investment purposes, they do provide in-game benefits too. Countries earn a 1% dividend from location sales within the country. This is paid immediately via the smart contract. The world and continents currently earn a 1% dividend for any country trade taking place below them. These assets can always be purchased and can't be removed from the market by their owners. 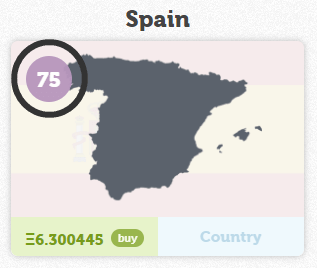 When a country is purchased it's price automatically increases by 25%. Once it's price exceeds 1 ETH it increases by 15% with each trade. This increase is implemented via the smart contract during a trade. Owners may not manually increase their prices, but they do have the option to lower the price by up to 20% every 24 hours. These assets also provide you with points, which in turn generate gold for you each day. Countries currently give their owners a bonus in battles that take place in that country. This currently gives country owners roughly 5% better odds in winning a battle. Every location has points, which is a rough measure of it's size. Larger locations can be enhanced to increase their size. This is a small location with a tiny population. This is a mega city with a population in the millions. This is an enhanced location that has been increased in size by its owner. 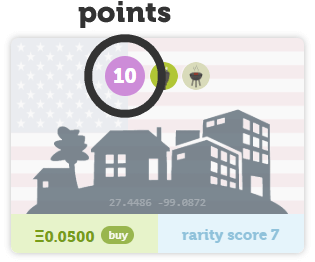 A location will start off with basic points from 1 to 50. This is roughly based on its population size in the real world. These points are hard coded into the smart contract and can never change. Countries have 75 points, continents have 150 points, and the world has 250 points. 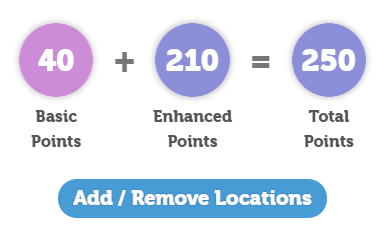 Any location that has 25+ points can be enhanced with more points by adding smaller locations to it. This is also known as embedding and is a way to bundle smaller locations into a bigger one. 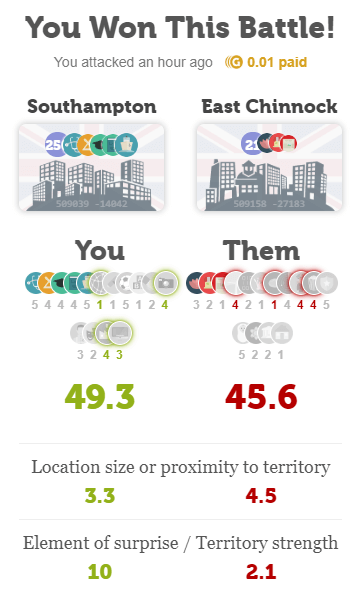 Any location that is 24 points or smaller can be embedded into a larger one. When a location is embedded it's points transfer to the bigger location. 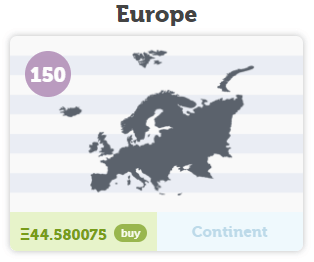 Also, if the enhanced location is sold in the marketplace then all the smaller locations are sold along with it. 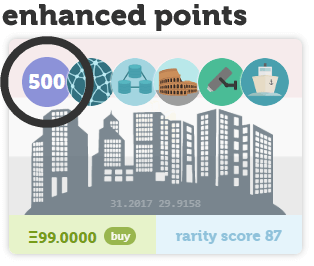 Only size 50 locations can enhance to 500 points, with smaller sizes having incrementally smaller possibilities. The total points of a location currently provide a small boost to battles that take place further away from your home square. This means big cities are able to project power further away from home. When battles are taking place close to home then points do not provide any benefit. In the marketplace you can buy and sell any asset. We will be incorporating more of the marketplace views into the game UI over coming months to make finding locations even easier. The main marketplace view shows you all locations. 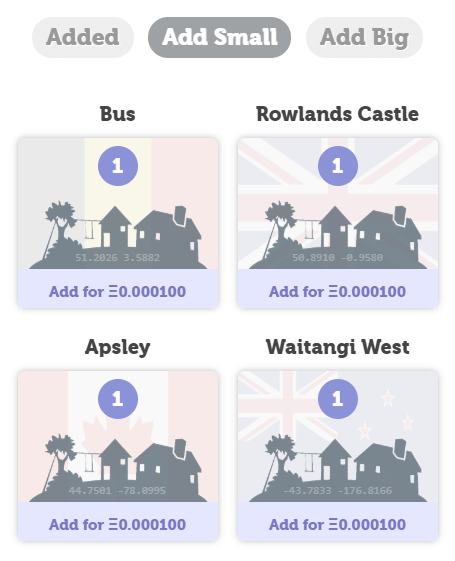 You can filter by points, country, or features. There are also options to hide your own locations, to hide very extreme pricing, or to show locations that are not listed for sale. The ticker shows recent sales. 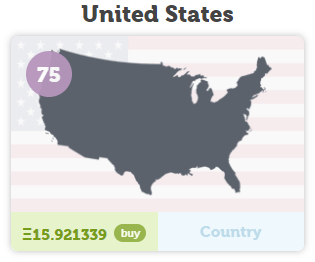 Currently all countries, continents and the world are listed in the marketplace. These use a slightly different market mechanism to locations. Premium assets are always for sale and can't be delisted by their owners. Their price increases by a fixed percentage when they are purchased, and owners can decrease their price once every 24 hours. Currently it is not possible to search for a location. Also, cities and places that have not been discovered yet are not shown in the marketplace. Fees are automatically deducted when an asset it sold, not when it is listed. These fees range from 2.9% to 4.9% depending on the dividends required for country holders.